This portrait was part of a set of three commissioned as a surprise Christmas present by one of the owners for his wife. Jack - named after the legendary jazz bass guitarist Jacko Pastorius - is a Labrador/Alsatian cross. Jack can do a great 'Hell Hound' impersonation if you rub his nose - all snarls, teeth and eyes, but with the wagging tail behind to show it's not for real! The set of reference photos I used for this portrait were taken on a holiday on Bodmin Moor. 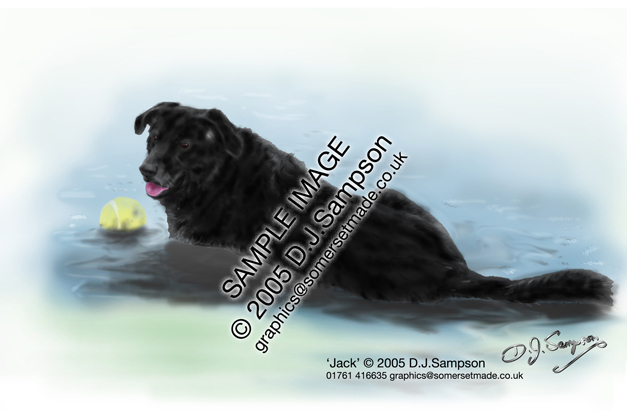 Several months after doing this work, I heard that Jack had eventually succumbed to old age, but the owners now have a permanent reminder of the favourite dog.